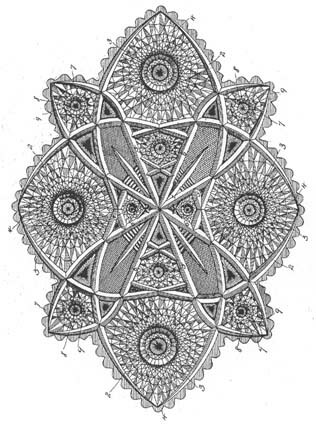 The Valencian pattern was patented by Walter E. Egginton on 17 Jan 1893 (pat. no. 22,136) while he and his father, O. F. Egginton, were employed by T. G. Hawkes & Company. The son retained the patent and took it with him when he joined his father at the latter’s newly established company in 1896. Therefore, one might expect to find this pattern signed with the Egginton trademark, but thus far no such examples have come to light. 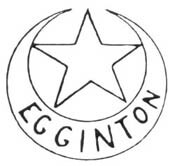 The Eggintons were “a glass family”, originally from Birmingham, England. Oliver Foley Egginton was one of four brothers from a second marriage. He specialized in glass cutting but was also knowledgeable about other aspects of the glass business. Oliver emigrated in 1865, joining his brother Enoch and half-brother Thomas in Maine where Enoch had been appointed superintendent of the Portland Glass Company at the time the company was established in 1863. In 1865 Oliver arranged for the immigration of his sons: Joseph Augustus, Oliver Enoch (called “George”), Alfred James, and Walter Edward to work at the Portland factory. Here Joseph soon became head of the company’s cutting department. and manufacture of stained (leaded) glass panels. Enoch, “George”, and Alfred James all died while the family was living in Montreal. Oliver Egginton left Hawkes and established his own company in 1896. Walter joined his father in this venture which was incorporated in 1899. When Oliver died the following year, Walter became head of the O. F. Egginton Company. Although it prospered initially, the company began to fail after 1910 and was dissolved in 1918. The Egginton trademark, above on the right, is said to have been acid-etched on glass as early as 1900 (Sinclaire and Spillman 1997, pp. 133-6; see also Spillman, 1996, pp. 284-287). [Composite Catalog, c1910] EGGINTON’S CELEBRATED CUT GLASS. American Cut Glass Association, 1982 (75 pp. ).